The IPCC (Intergovernmental Panel on Climate Change) was set up in 1988 by member governments and established by the World Meteorological Organization (WMO) and the United Nations Environment Programme (UNEP). Its objectives were, and still are, “to assess on a comprehensive, objective, open and transparent basis the scientific, technical and socio-economic information relevant to understanding the scientific basis of risk of human-induced climate change“ (From the Principles Governing IPCC Work). Briefly, the IPCC wants to see how the climate it changing, whether humans are contributing to this change and, if so, how much and what are the impacts on the Earth. The reports that are published every 6 years are based on published scientific research from across the world. Each IPCC report is subdivided into three parts which concentrate on 1) the physical science basis, 2) impacts, adaptation and vulnerability and 3) mitigation of climate change. The most recent report, the 5th (AR5), had its Working Group 1 analysis published in September 2013. It is from this report that the figures I explain in this blogpost originate. To give a sense of scale, AR5 has over 800 contributing scientific authors from over 80 different countries. More than 9000 peer reviewed scientific papers contributed to the reports and over 100,000 comments were made and replied to. In terms of scientific review groups, nothing this comprehensive has been achieved on such a scale in any other discipline. The video below was produced when the Working Group 1 report was published. It gives an overview of the scientific reasoning behind the major statements in the report summary. If you have read any news coverage of the AR5 report, or perhaps the ‘Summary to Policy Makers’ you will see it is full of phrases such as ‘extremely likely’ and ‘medium confidence’. 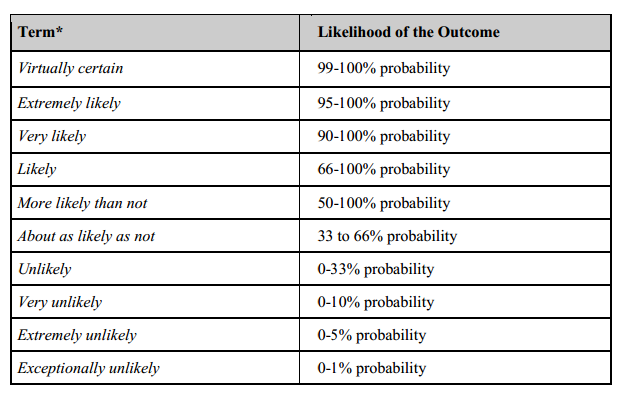 These terms all have numerical definitions which are summarised in the figures below, for example, extremely likely has a value of between 95-100% certainty. The values will have been calculated using evidence based on observations, computer models results and scientific expert opinion. All figures shown below can be found in the Summary to Policy Makers report. All the evidence stated above have been combined and assessed to determine the headline statement of the IPPC AR5 that human contribution to climate change is now extremely likely. Figure SPM.1: (a) Observed global mean combined land and ocean surface temperature anomalies, from 1850 to 2012 from three data sets. Top panel: annual mean values, bottom panel: decadal mean values including the estimate of uncertainty for one dataset (black). Anomalies are relative to the mean of 1961−1990. This first plot is fairly self-explanatory. It shows the temperature records based on observational evidence for the land, surface (air closest to the ground) and oceans combined. For more information about temperature records that go further back in time, my previous post entitled ‘4.5 Billion Years of the Earth’s Temperature’ has figures and explanations that may interest you. The temperature values are shown as relative to the average temperature from 1961-1990. The period from 1961-1990 is defined as a ‘normal period’ which is an average value from a 30 year duration. A normal period must have an accurate representation of the present-day or recent average climate. This period should feature a range of climatic variations, including several weather anomalies (for example, severe droughts or cool seasons). 1961-1990 is the official normal period adopted by the WMO. For more information about how these periods are defined please see here. 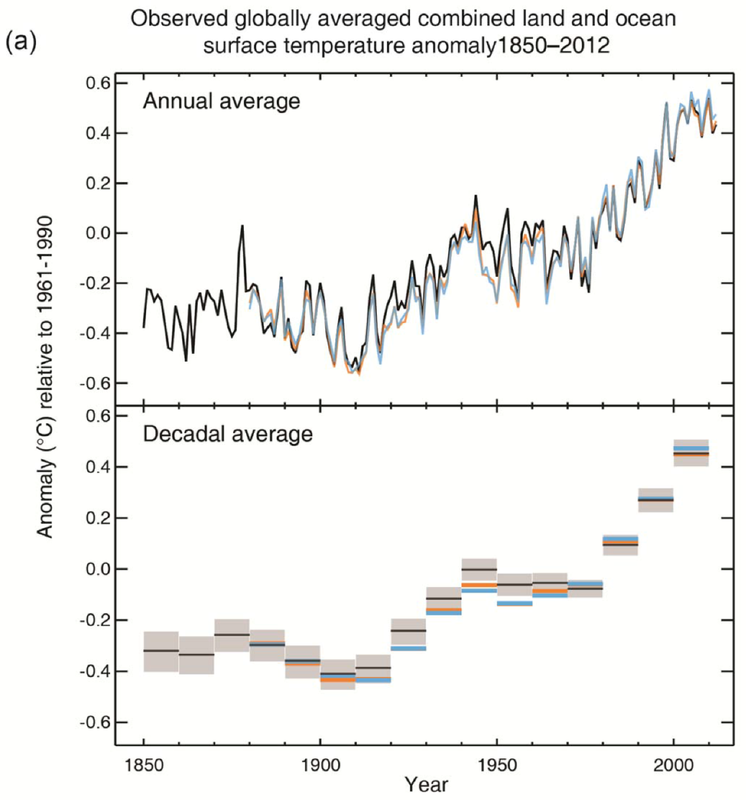 The top figure shows the temperature values as annual data points but the bottom has been averaged into decadal (10 year) values (the different colour lines showing different data sets used). The longest data set we have is the one in black, the grey shaded areas shows the spread in uncertainty associated with this data set. You can see the spread of the shaded area is larger the further back in time you go, showing how our confidence in our observations has improved as more robust measuring techniques are introduced. The first seven decades (the Industrial Revolution) show almost no trend in temperature (if anything a slight decrease in global values) however temperature rises from the 1920s to the 1950s. A plateau is then observed for a few decades before values dramatically rise to present day values. The last three decades have been warmer than any other decade in the last 150 years. This figure gives more information than the one before by showing where in the world the temperature change is occurring. It is sometimes assumed that the rate of global warming is the same throughout the world, but this is not the case. 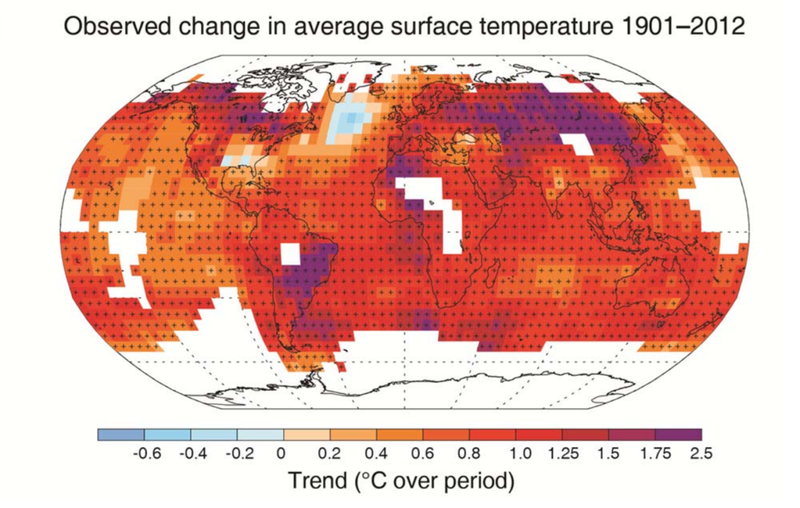 You can see the most intense warming occurs over large land masses. It should be noted that the areas marked with a + sign show when the temperature change is above 10% of the starting temperature which indicates a relatively significant change. Not all areas of the world are warming however, as the blue indicates in the North Atlantic Ocean, there are also certain parts of Antarctica that are cooling but this is not shown in this diagram. As stated in the figure description, the white regions are where <70% of the total data set is recorded and more than 20% of the total data set is in the first and last time periods. Without this information the exact value of temperature change cannot be calculated. This is not to say scientists do not know if these regions are warming or cooling, but the values calculated are not robust enough to the stated here. This figure shows the change in rainfall over two periods in the last 110 years. Like the figure before areas of white on the land surface indicates where there is not enough data to be able to calculate a value. By comparing the two figures it is clear that we are much more confident in our values for the second half of the 20th century as there are fewer white gaps. This is due to a much larger network of measurements being taken, including satellite data and ground based stations. Africa and South East Asia received less and less rain throughout the 20th century, whereas Europe and the Americas experienced more. The North West coast of Australia has got wetter but the South and East coasts have got drier (this is particularly important as most of the populations of Australia live on the East Coast). This change in rainfall will have a very large impact on societies across the world, both negative and positive. The IPCC Working Group 2 will publish a report in March 2014 concentrating more on the impacts of climate change for the past, present and future. This figure has a lot of information and can appear quite complex. The individual graphs show computer model values and real measurement values for different regions of the globe. The yellow boxes are temperature values for the land and the white are for the oceans/seas. There are two different types of model simulations here, one where only natural processes that drive changes in climate are considered (for example solar variability, aerosols from volcanic eruptions etc.) These model runs are shown in purple. There are many different computer models in the world and all will produce slightly different results, which is why the pink lines are shown as shaded areas to show the spread in results, or the uncertainty associated with these models. The pink shaded lines show computer model results where both the natural climate forcings AND human forcing are considered in their runs. For example, these will include fossil fuel emissions, CFC emissions etc. Crucially, in all of the graphs in this figure, the only way for the model results to agree with the measured observations (shown as thin black lines) occurs when both natural and human climate forcings are considered. For a specific definition of radiative forcing please read the beginning of my first blog ‘A brief introduction to Global Warming’ but essentially a positive radiative forcing (RF) means a warming of the atmosphere and a negative means a cooling. The figure above shows the contributors to climate change. 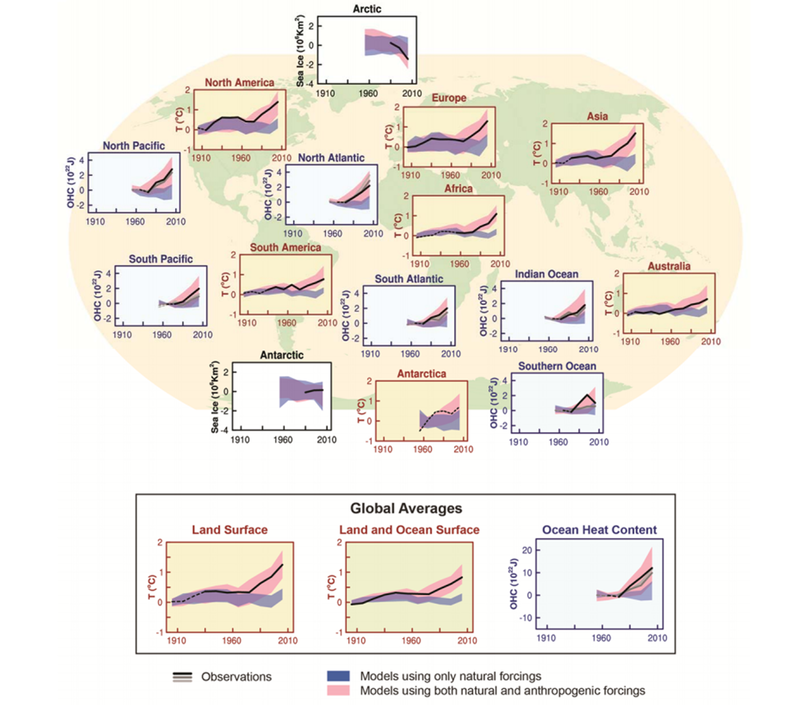 This figure has been developed from the previous report published by the IPCC in 2008. This new figure now shows how each factor can affect temperature (the second from the left column). For example, the top compound carbon dioxide (CO2) warms the atmosphere directly by being present in the atmosphere however when looking at the methane value (CH4) there are four compounds in the second from left column. This means that not only does methane warm the atmosphere directly but when it reacts with other compounds in the atmosphere and produces water (H20), ozone (O3) or carbon dioxide (CO2) then these also warm the atmosphere. The corresponding colours on the bar to the right show how much of this warming is because of which process. The majority factor being direct warming from methane itself but then warming from ozone (produced whem methane reacts in the atmosphere) also has a large contribution. Aerosols can have both a warming and cooling effect on atmospheric temperatures. In the 5th IPCC report it is now possible to see which types of aerosols warm and which cool and by how much (for more information about aerosols please read by blog ‘A brief Introduction to Aerosols’). Our confidence for the RF values are stated in the right column. Figure SPM.7 | CMIP5 multi-model simulated time series from 1950 to 2100 for (a) change in global annual mean surface temperature relative to 1986–2005. Governments, policy makers and climate scientists have all resolved four different representative concentration pathway (RCP) scenarios to predict the average global temperature leading up to 2100. 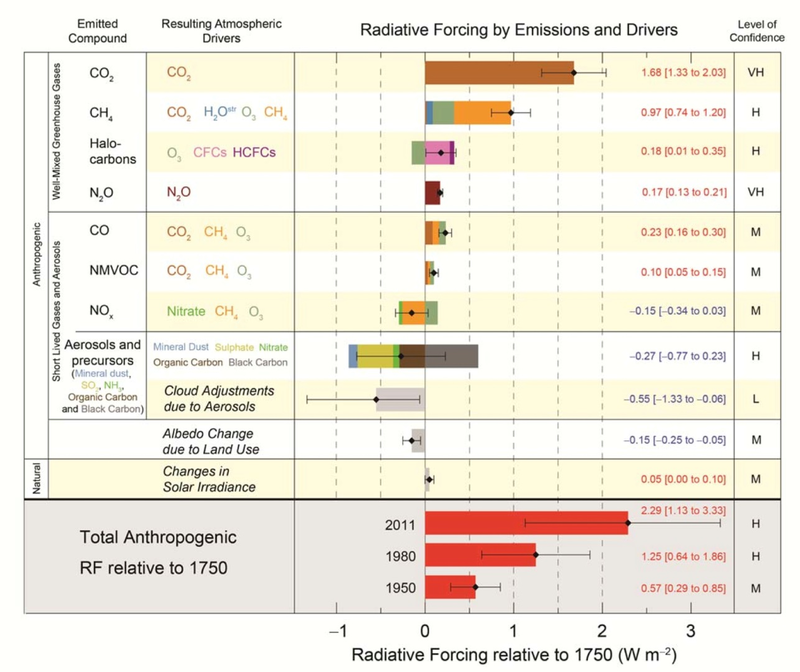 These four RCP values relate to what the radiative forcing could be by 2100 and are 2.6, 4.5, 6.0 and 8.5 respectively. For example, the RCP 2.6 has a radiative forcing of 2.6 (very similar to today’s values – see graph below) whereas a RCP value of 8.5 has over 3 times the amount of warming by 2100. The figure above shows that there could be a huge difference in global average temperature depending of which RCP scenario the world adopts. To get a sense of perspective, for the RCP 2.6 scenario the world must adopt a very strict reduction of greenhouse gas (GHG) emissions – this is effectively the ’best case scenario’. The RCP 8.5 is a ‘business as usual’ scenario where we make little or no reductions of GHG emissions. It should be noted that we are currently (as a globe) doing slightly worse than the RCP 8.5 scenario due to an increase in power production in developing countries and a failure to strictly reduce current emissions. It is generally agreed that a temperature increase of 4 ⁰C would have significant impacts on global society. I hope you have enjoyed reading this post, I have certainly tried to cram a lot of information here! 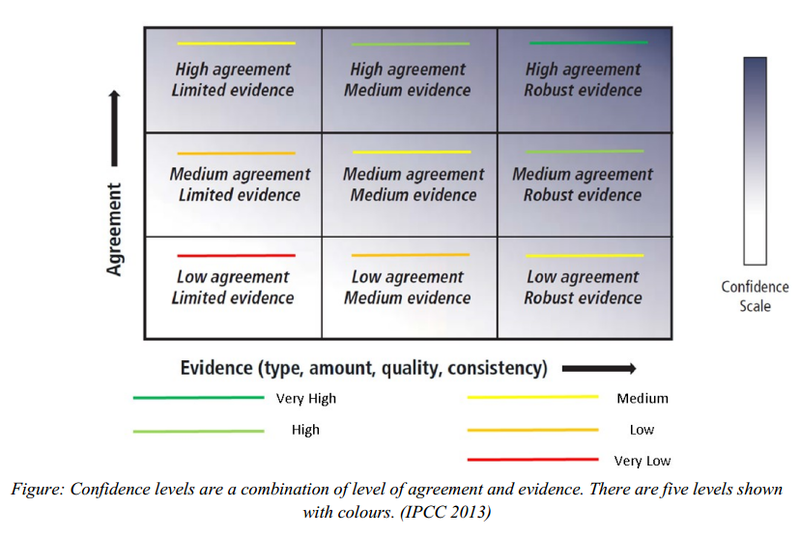 For anyone who is interested, one of the lead authors of the IPCC AR5, Prof. Piers Forster, summarised the report in 18 tweets.They are well worth a read and may help to summarise some of the things written in this post. The link to these tweets can be found here. This blog post will give a brief overview of how the Earth’s temperature has changed up to the present day. We only have actual temperature measurements going back a couple of hundred years however there are several other methods we can use to give reliable estimates of the Earth’s temperature in the past. ‘Proxy’ measurements include rock sediment sampling, tree rings and ice cores. The video below gives a good introduction to how the British Antarctic Survey use ice cores to generate accurate atmospheric gas and temperature records going back 800,000 years! The diagram below shows an overview of the Earth’s temperature from 500 million years ago to the present and may help with picturing the changes in temperature when reading this post. The Earth was formed roughly 4.5 billion years ago. Until 3.8 billion years ago it was a completely inhospitable environment with the surface being mainly molten lava. The Earth eventually cooled enough for its crust to form. Land masses could then exist and, when it was cold enough to rain, the oceans formed. Around this time the atmosphere was predominantly consisted of methane (CH4) and ammonia (NH3), two extremely important greenhouse gases, thus their radiative forcing kept the Earth’s atmosphere warm and toasty! Oxygen (O2) in the atmosphere was almost non-existent until ~2.5 billion years ago. The evolution of cyanobacteria, which produced oxygen as a bi-product of photosynthesis, meant that O2 levels dramatically increased. This rapid change in atmospheric composition caused widespread extinctions of most of the previous anaerobic bacteria. This ‘new’ atmosphere made the Earth much colder as there were no longer bacteria emitting radiative forcing-methane and carbon dioxide into the atmosphere. It is thought that the average temperature at the equator was roughly the same as current Antarctic conditions! History of the Earth’s Temperature. originally sourced from here. During this period the Earth’s atmosphere became more stable, eventually cooling to similar temperatures to today’s average (see first section on plot above where the temp change is ~0 ΔT). During this time the evolution of aerobically respiring animals occurred, i.e. DINOSAURS! This meant the concentration of CO2 increased and global temperatures increased again. We know that there was a sudden decrease in temperatures around 65 million years ago which resulted in the extinction of the dinosaurs. The most widely accepted reason for this is a massive comet hitting the Earth sending huge amounts of matter (read: aerosols) into the atmosphere. This caused a global decrease in temperature due to an increased albedo effect (for more information about this and the contribution of aerosols to this effect please read my previous blog: An introduction to aerosols). Thermal Maximum (55 million years ago)~55 million years ago, records show a massive warming of between 5-8 ⁰C in just 20,000 years (It is thought that during this time it was so warm palm trees could have grown in the poles!). The direct cause is still disputed amongst scientists, however it is generally agreed that a sudden release of carbon into the atmosphere caused the warming. This was probably in the form of methane from either the ocean bed or from within ice structures called clathrates. It was after this period that mammals started to evolve. The thermal maximum continued to around 35 million years ago when the Earth cooled into the Ice Age. The theory behind this change in temperature is that a type of fern named Azolla became extinct. The Azolla then sank to the bottom of the ocean, taking with it much of the carbon absorbed as carbon dioxide, therefore removing it from the atmosphere. With the carbon dioxide not present to act as a greenhouse gas, global temperatures decreased again. Unlike the last period of cooling, this time the Earth had fully formed continents, including mountain ranges, and land mass at the South Pole (Antarctica). This new land coverage helped amplify the cooling via circulation. An ice age is defined as when a planet’s poles are covered with ice, so technically we are still in one! Within an ice age there are periods of glacials and inter-glacials. Glacials are episodes of colder temperatures whereas inter-glacials are warmer time phases. Both will last several thousands of years. These changes in climate can be explained with the Milankovitch cycles (please read post #2 – The Milankovitch Cycles – for more information). NB: You can see on the plot above sections labelled ‘the mini ice age’ and ‘the medieval warming’ period. I plan to do future blogs on these events as this post is getting far too long! The warming we have seen in recent years has been like nothing experienced before in the Earth’s history. The last 100 years of warming has cancelled out the previous 6000 years of cooling that occurred before. The video below (sourced from NASA) shows just how dramatic the rate of global warming is over this time period. Thanks for reading to the end of this post, it ended up a bit too long! Next time I want to introduce an event called the Northern Atlantic Oscillation: the phenomenon that is thought to have caused the medieval warming period.